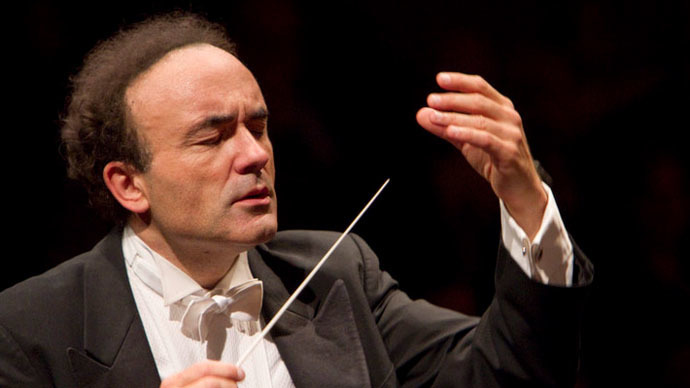 A French conductor, Frederic Chaslin, who has performed with Israeli orchestras for a long time, refused to participate in a performance after Israeli Opera denied his request for a short tribute to victims of the Paris terror attacks last week. Chaslin wanted Puccini’s La Rondine performance on Saturday to be preceded by the Israeli national anthem, Hatikva, and a few words in memory of those killed. Four Jewish hostages at a kosher store were among those who lost their lives during three days of mayhem in Paris following the attack on French satirical weekly Charlie Hebdo. Israeli Opera refused the conductor’s request. Israeli Opera in Tel Aviv-Yaffo said in a statement that although it condemned the Paris attacks, it believed it was wrong to highlight the issue in a theater. “Israeli Opera is pained by the tragedy and its aftermath and its heart is with the French nation and Jewish community,” the statement says. Chaslin disagreed and refused to conduct the opera on Saturday. However, the conductor will still commemorate the Paris attacks’ victims. “My orchestra, the Jerusalem Symphony... will dedicate its next concert on Wednesday to all the "Charlies" and we are performing in 15 days in Paris so we will be in Charlie town,” he said on Facebook. The post has been welcomed with “bravos” in comments. Social media users have mostly been on Chaslin’s side. @chaslin appreciate your efforts at the Tel Aviv Opera. Their refusal is shocking and bizarre. @chaslin JeSuisChaslin! Felicitations maestro-stand up for what you believe is right!! Israeli PM Benjamin Netanyahu marched together with other world leaders on Sunday in solidarity with the 17 victims of the Paris attacks. He earlier reacted to the deadly kosher store attack by urging all Jews from Europe to immigrate to the state of Israel to escape the “rising tide of anti-Semitism.” He called on lawmakers to amend legislation in order to make immigration easier. Families of the four French Jews killed in the Islamist attack in Paris have decided to bury their dead in Israel. Netanyahu has welcomed the decision. The bodies of Yoav Hattab, 22, Yohan Cohen, 22, Philippe Braham, 45, and François-Michel Saada, 55, will be taken from the forensic institute in Paris on Monday and flown to Israel, a Jewish community source told AFP in Paris. The funerals will start at around noon (10:00 GMT) at Jerusalem's Givat Shaul cemetery, according to the prime pinister's Office, as cited by The Haaretz.